Do you feel like you need a shower after bringing your cans in from the curb? Does your garage reek from the smell of your trash? 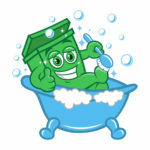 Let Green Can Cleaner clean, sanitize, and deodorize those cans today. Our process uses state of the art equipment to clean those dirty cans. Pressurized hot water and steam kills 99.9% of all bacteria and germs while still being kind to the environment. We will leave your cans looking and smelling like new and take the mess with us! We use state of the art equipment and technology to offer you the most thorough cleaning possible. Our services include residential and commercial trash can cleaning and pressure washing. It is impossible to clean your cans the way we can. We use 100% Green Seal Environmentally Safe Cleaners combined with high pressure and 190-degree water to deep clean your cans. Leaving them safe, sanitized and deodorized for you. We also remove all waste and wastewater from your home preventing any additional contamination from your home, yard or community. We specialize in a process that will not only pressure wash your wood fences and decks but it will restore and preserve them as well. We know that this maintenance not only adds enjoyment to your home but also value. We aim to preserve the investment you have already made in your home so it can last as long as possible. We offer many services to help you make your home beautiful. We pressure wash and clean exterior surfaces specializing in wood decks and fences. We utilize a special wood restoration process to bring back the beauty of fading wood to preserve it for your use into the future. If you have a project in mind, get in contact with Ben at Green Can Cleaner today! When it comes to quality work, we should be your first call. We are looking forward to hearing from you.